This newly released collection—what some might call Horowitz’s “serious” work— is both a testament to his unique creativity and a blast to listen to. Sit back and enjoy great performances of quite difficult music played by excellent musicians under the direction of a composer with a vision. I love that I recognize Steve in his work regardless if it’s music for a Sponge Bob Game or nearly impossible 12-tone serial compositions for the band. This is to say, Steve has a voice, a uniquely strange, coherent incoherence that might make you dance or might make you wonder if there was something funny in the punch. And this, in the end, is really all that any of us in the arts can aspire to—something to say and a way to say it that stands out. He is prolific, a constant doer, an excellent band leader, and a die hard creative who possesses an enviable mix of talent, tenacity, great ears, and a killer sense of humor. 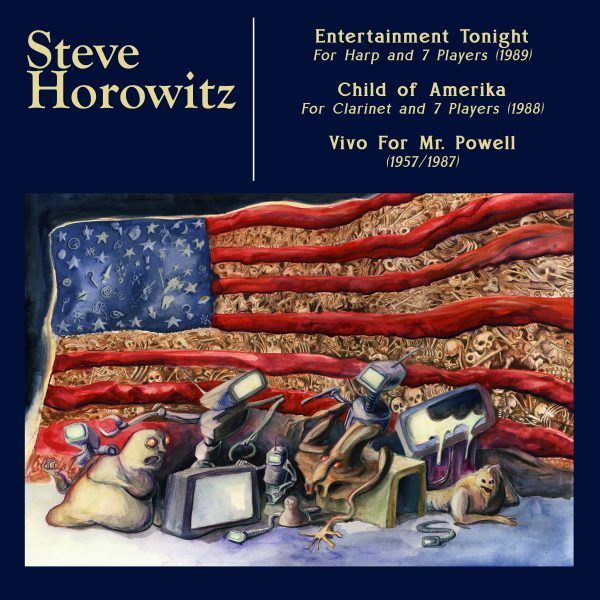 With this newly produced collection of seminal pieces from the late 80’s, Steve gets it right, once again, and it’s a hell of a lot of fun to listen to! Official release date is June 1, 2016. Now available for pre-order on Amazon and iTunes. This title was taken from the Jerry Rubin book “Do it” & was composed for Clarinetist Timothy Bonenfant. Cory Wright plays the part on this recording. I will order as my last meal: a hamburger, french fries and a Coke. I listen to the radio and watch color TV. I dig department stores, huge supermarkets and airports. I feel secure (though not necessarily hungry) when I see Howard Johnson’s on the expressway. I groove on Hollywood movies-even bad ones. is based on an actual broadcast of the TV show by the same name. was composed by Mel Powell and is the final movement of his “Divertimento for Five Winds” composed in 1957. Here, I have re-orchestrated it for my ideal ensemble, a double rock band with horns. Ever patient friend, mentor, teacher and wonderful composer. I have stayed in touch with Mike over the years, he still lives in LA and still teaches at Cal Arts. It is only now that I have my own students that I understand how he must have seen me in my students days. Mike helped to guide a lot of my thought on these pieces, you should check out some of his own compositions, fantastic stuff! The Harpist who I wrote “Entertainment Tonight” for, who passed away this year. I remember sitting with her, going over the parts, discovering the things that did and did not work in my writing. Susan was a great teacher and friend and fantastic talent who will be greatly missed. who plays her part on this recording sounds phenomenal. She does the music and Susan’s memory justice. She is dedicated and just crazy talented enough to pull off Harp and rock band with ease and grace. you can hear him laugh as a oboe solo section is played by Tuba. You can find more about me and my music at my personal page and at The Code International.